My good buddy, John Pata (Dead Weight), is who first told me about A Cadaver Christmas. As I've said before, I was sold on the title instantly. I met John at the Days of the Dead convention in Indianapolis (July 6-8, 2012), where I also met Justin Beahm. Justin writes for Fangoria, Famous Monsters of Filmland, is a filmmaker and on and on. That was a fabulous weekend. 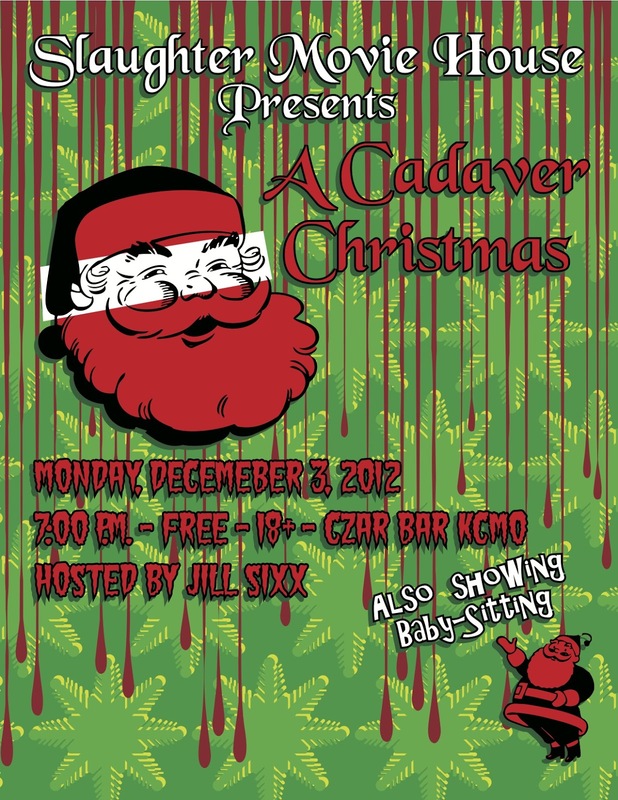 First thing, when I got home from Indy, I googled A Cadaver Christmas. What popped up first? Justin's Fangoria piece on the film. So, I emailed Justin and he put me in contact with the writer/director, Joe Zerull. I also noticed that the film's poster was designed by my favorite artist, Tom 'The Dude Designs' Hodge. We booked the film for December and made an awesome holiday party out of it. This was also a very special night due to our short film, Baby-Sitting, being our very first international film (France)! How did I discover this? Indianapolis, again! I never thought Indiana would enrich my life as much as it has. It was at HorrorHound Weekend (Sept. 14-16), where Elvira hosted the HorrorHunt Film Festival. Baby-Sitting took home the award for Best Gore and Lucas Masson (writer/director) was there to accept! I made sure to get Lucas' info and later asked him if I could screen his film here in KC. The rest is history. Check out the photos from the event HERE. Photos by Anna-Marie Perry.